If you are seeking NW Calgary Full Dentures for yourself or for a family member, the dental team at Point McKay Dental is here to help make the process as easy as possible. At Point McKay Dental, we provide superior denture solutions for patients with missing teeth. We offer traditional, immediate, partial dentures, as well as denture relines. Our Full Dentures provide efficient, gentle, and quality service; call our office today to schedule an appointment. 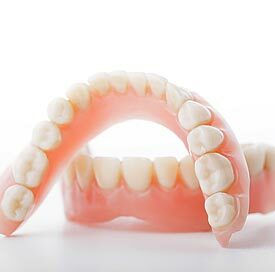 Approximately 4 million Canadians wear dentures! Ordinary dentures leave little room for customization. Men and women, old and young, get basically the same look. The result is a perfect row of identical teeth, which causes many dentures to look false. Dentures are replacements for missing teeth that can be removed and put back into your mouth. A denture consists of a plate or frame holding one or more artificial teeth in place. Dentures can take some getting used to, and while they may never feel exactly the same as your original teeth, they can look natural and are now more comfortable than ever. At Point McKay Dental, we will advise you of all treatment options available based on your unique case. We will take a series of impressions of your jaw as well as measurements of how your jaws relate to one another and the space between them. We will create a waxed up model denture in the exact shape and position of your new proposed dentures. This will allow you to try the models and to make sure they fit right. Additionally, the model dentures will show you the colour and shape of your replacement teeth to ensure your satisfaction with the appearance of your new smile. Once the fit, shape and colour of the dentures have been confirmed, the final dentures will be crafted. Once the full denture has been created, we will make sure it fits properly and continue to make any adjustments needed. It’s important to keep in mind that adjustments may be needed from time to time as your mouth adjusts to the new denture. If your mouth gets sore, don’t wait for it to get worse, it is recommended to contact us immediately so that we can check how your mouth is adjusting to the new denture. We are happy to help you and strongly encourage you to come in to see us for a denture adjustment as soon as you can. We invite you to book an appointment at Point McKay Dental today. Dr. Paul Hul looks forward to the opportunity to meet all of your denture needs. Call us at (403) 283-7829 to book your Full Dentures Consultation with us today!